DJ Charlesy's currently doing his Capital XTRA show from Down Under where he's touring with Tinie Tempah. He sent us this tour diary to make us feel jealous. It did. 1. Wednesday 26th February: Bags are packed! 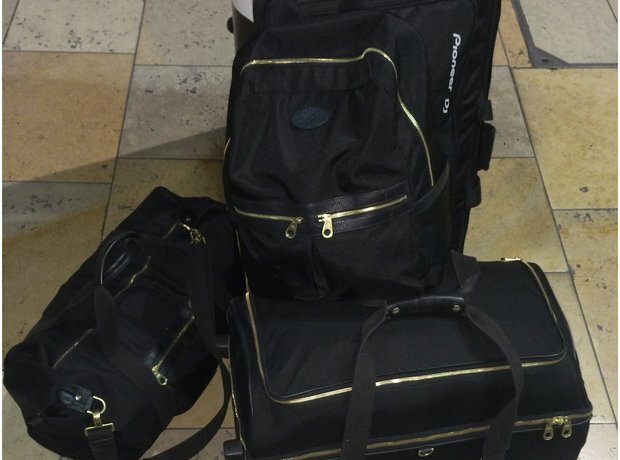 "Bags packed ready for three weeks in Australia, New Zealand and Malaysia.. First 12 hour flight to Hong Kong for a stopover." 2. Thursday 27th February: A quick stopover in Hong Kong. "Landed in Hong Kong tried to stay awake the whole flight so I sleep on the next flight; 9 hours to Brisbane, Australia." 3. Friday 28th February: We arrive in Brisbane, time to hit the beach. "Got to Brisbane safely and now time to enjoy a day off. We headed to a main made beach in the middle of the city. Today was all about staying awake." 4. Friday 28th February: Catching up with friends. "Made it to the evening without sleeping and it was now time for some festival pre-drinks and met up with some friends from London who were travelling." 5. Saturday 1st March: Playing our first gig at the Future Festival. "First Future Music Festival Show of the tour. Great show, gooood crowd, but few technical issues as is always the way with the first show." 6. Saturday 1st March: Watching Knife Party was crazy before heading to Perth. "Stayed around to catch a few sets and the highlight of the day was seeing Knife Party perform in the Haunted House Arena. One of the best shows I've seen in a while. Production, Sound, Visuals were all on point. CRAZZZZZY!!" 7. Saturday 2nd March: Back on stage again in Perth. "Amazing show. Definitely a louder and bigger crowd then Brisbane (No offence - haha). 8. Saturday 2nd March: What a view! "He's my view from the stage in Perth." 9. Saturday 2nd March: Time to get some interviews done... and some chicken! "Time to get back to work. Worked my way around some of the dressing rooms to get interviews for my Capital XTRA show this Friday. Had a chat with Chase & Status, Sub Focus & Rudimental who are definitely mental. THE CHICKEN BELONGS TO THEM. Find out why on my show!! HAHAHA!" 10. Saturday 2nd March: What a night! Headed out to a club called Shape where Sub Focus and Knife Party were doing a secret show but it turned into an experience of a lifetime. During Knife Party’s set Deadmaus, Hardwell, Chuckie, Martin Garrix & Carnage all jumped on the set. DEFINITELY SOMETHING YOU CAN'T PAY TO SEE!" 11. Monday 3rd March: On the way to Sydney. "Here I am on a plane." 12. Tuesday 4th March: Sydney, I love you! "Not a boring day at all. Went round site seeing. SYDNEY IS AMAZING!" 13. Tuesday 4th March: Dave Chappelle time at the Opera House. "Managed to get some tickets to go and see Dave Chappelle at the Opera House. Such a great experience. He is too funny." 14. Wednesday 5th March: We arrived in Dunedin, New Zealand. "Long travel day to New Zealand, but got a very nice greeting at the airport. A group of school kids came and gave a performance of a Hukka. Actually quite scary haha!" 15. Thursday 6th March: Not a bad view at breakfast. "Woke up to the best view and had the breakfast. Liking the vibe of Dunedin." 16. Thursday 6th March: Mmm chocolate... shame I don't like it. "Got taken on another site-seeing trip but this time to the Cadburys Factory. It’s a shame I don’t like chocolate." 17. Thursday 6th March: Running up the steepest street in the world. Ouch. "Soundcheck done, had a nice mess around doing some old tracks with Tinie then went to visit the steepest street in the world. Like fools me and T run up it. Paying for it now!!"